Avid readers of this blog will remember one of the first posts I made, over a year ago, about a redesign of the Star Waggons logo that I had completed at the time. There may have been some hubris, on my part, in comparing my work to that of the lettering genius Ed Benguiat, but while continuing to read Life With Letters …as they turned photogenic by Ed Rondthaler, I came across a rather familiar looking comparison between the old and new New York Times masthead. Looks like Mr. Rondthaler had made the very same visual comparison when he put this book together back in 1980 or so. Neat! I have been fortunate to witness several great moments in graphic history, but none more overdue than the day the New York Times finally dropped the period from its masthead. Newspaper mastheads traditionally placed a period after the name, but by 1900 most papers had given up the practice. Even The Enterprise, my father’s little amateur monthly of 1885, had no period. 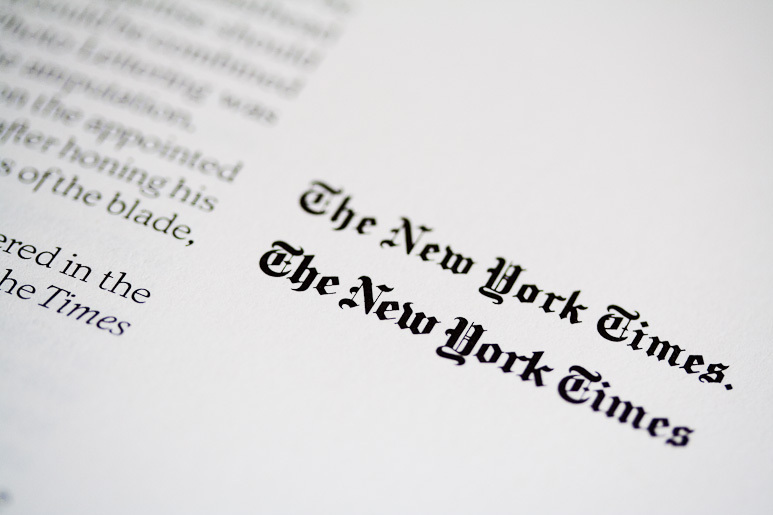 But The New York Times was not one to rush headlong into such change without due consideration. Meanwhile the period appeared day after day and week after week consuming ink, I estimate, at the rate of $84 a year. It was not until 1966 that the Times concluded there was little to be gained trom further procrastination, and decided to bring its masthead in line with popular usage. It was felt, that appropriate expertise should be sought for the execution of this change, and that it could be combined with minor alterations needed at the Same time. Photo-Lettering was honored in having Ed Benguiat selected to perform the amputation. The ailing masthead was brought into our quarters on the appointed day. When the operating table was duly set Ed Benguiat, after honing his trusted scalpel to a fine edge, administered four deft strokes of the blade, swiftly severing the period with a minimum of discomfort. It was an historic moment. One that will be long remembered in the annals of joumalism. I hope we returned the severed period to the Times as a valuable contribution to its archives.